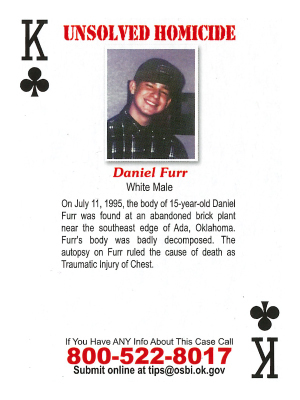 On July 11, 1995, the body of 15-year-old Daniel Furr was found at an abandoned brick plant near the southeast edge of Ada, Oklahoma. Furr's body was badly decomposed. The autopsy on Furr ruled the cause of death as Tramautic Injury of Chest.